Do you love to sing? Is music something you’re passionate about? Would you like to meet others who feel the same? 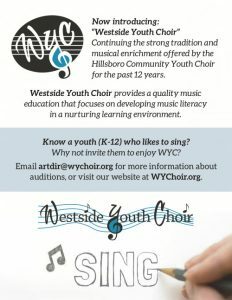 The Westside Youth Choir is open for registration. Join us for a fun, supportive learning environment. Sight reading skills and music theory are woven into the program to make you a better musician. Choirs for K-12.